When the Federal Open Markets Committee (FOMC) met in June, the decision to hike rates was already a foregone conclusion. Not only were traders and analysts almost unanimous about a rate hike but even the CME Fed Futures Monitor was indicating a 97% probability of a 25bps rate hike. When the Federal Open Markets Committee (FOMC) met in June, the decision to hike rates was already a foregone conclusion. Not only were traders and analysts almost unanimous about a rate hike but even the CME Fed Futures Monitor was indicating a 97% probability of a 25bps rate hike. When it happened on June 13, it marked the seventh rate hike since January 2016. During these 30 months, the Fed Fund rate has gone up from the range of 0.00%-0.25% to a level of 1.75%-2.00%. 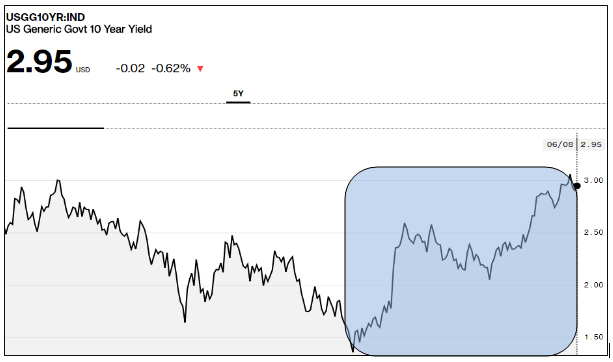 The above chart of the US 10-year generic bond shows a clear hardening of yields since 2017. This is clearly indicative of the US bond yields getting beyond the 3% mark with more rate hikes in the offing. The 3% mark in US yields is a critical benchmark and a consistent close above that will be a clear signal of a hawkish outlook on rates. What was the gist of the Fed Policy announcement? The Fed undertone was certainly hawkish. Firstly, the US GDP growth was showing signs of crossing 3% in the June quarter and the full year growth forecast could outpace the World Bank estimates of 2.8%. Secondly, higher crude prices and higher food prices in the US will carry the rate of inflation well beyond the 2% mark. What was left unsaid was that if the US persisted with its policy to impose tariffs on imports from China then inputs costs could go up in the US and push up inflation further. Thirdly, the labour market had stabilized at around 3.8% and the Fed reiterated its commitment to keep the US economy at the lowest possible unemployment level, which hints at more rate hikes. The Fed feels that wage inflation in the coming quarters could also add to the retail inflation. The Fed projection for the next two years is that core inflation and overall inflation could remain at the level of 2.1%, while the GDP growth could improve to 3.1% in 2019 and 3.4% in 2020. That essentially implies a sustained hawkishness at least till the middle of 2020. The tax cuts announced by the government, the higher push to infrastructure and the likely tariffs on key Chinese imports could be instrumental in higher domestic inflation in the US and better domestic growth. The Fed has almost guided for two more rate hikes in 2018 (a total of 4) and another three rates hikes in the year 2019. This total of five rate hikes till the end of 2019 is likely to take the Fed Funds rate from the current range of 1.75%-2.00% to a level 3.00%-3.25% by the end of 2019. There are few immediate implications that are visible at this point of time. A lot will depend on how the US rate hike trajectory evolves in the next few policies. The immediate impact of the Fed rate hike will be that the US dollar will strengthen. That was already visible in the currency markets in the immediate aftermath of the Fed policy announcement. A strong dollar could put further pressure on the INR, considering that the rupee stabilized only after RBI had hiked repo rates in its June policy. A stronger dollar will mean a wider trade deficit and the current account deficit getting back above 2%. The forex reserves have taken a real hit in the last few months with the RBI defending the rupee by selling dollars. One can now look forward to something akin to a NRI deposit scheme that Dr. Rajan had brought out in 2013 to shore up dollar reserves. Gold could be another casualty in the entire Fed story for two reasons. Firstly, gold prices have never done well when GDP growth has been good and that is what the Fed is indicating. Secondly, gold is negatively related to the dollar value. Flows could be the immediate concern for EMs like India. FPIs have pulled out over $6 billion from Indian markets in 2018 and a hawkish trajectory means that FPI flows are unlikely to come back for now. That may not really be a worry if the domestic mutual funds can maintain the tempo of inflows. Lastly, there is good news. India has normally benefited from a strong growth cycle in the US. Sectors like pharma, information technology and auto ancillaries are likely to benefit from stronger growth in the US. Also, Fed rate hikes could be positive equities as an asset class and Indian equities in particular. The ball will now be in the court of the RBI as to how it handles the repo rates. Interestingly, the next Fed meeting and the RBI policy meeting will conclude on August 1. It remains to be seen what the RBI will do in its policy.